Around the start of the twentieth century, when the original versions of both these quintets first saw the light of day, apart from examples by Schumann, Brahms, Franck, Fauré and perhaps Stanford, there wasn’t exactly a surfeit of piano quintets. Bridge and Scott were both born in 1879 – the same year coincidentally as John Ireland, Thomas Beecham and Hamilton Harty. What possibly motivated the former pair to produce piano quintets of their own, might well have been compatriot Joseph Holbrooke, one year their senior, whose own example had just made a powerful impression at the time (see Marco Polo 8.223736). 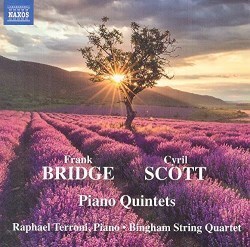 In fact, as the excellent, and highly-informative sleeve-notes by Giles Easterbrook go on to explain, pianist Raphael Terroni dearly wanted to record the Holbrooke and couple this with the Scott from the original 1989 recording, but having sadly passed away in 2012, this was not possible on this CD. It would surely be true to say that Bridge is a more familiar name today than either Scott or certainly Holbrooke. He studied under Stanford and others at the Royal College of Music, and played viola in a number of quartets, before devoting himself to composition. His idiom at the time of World War I tended towards moderation, while after the war his language developed significantly, building on his experiments with impressionist harmony. Bridge was ever frustrated that his later music was largely ignored while his earlier ‘Edwardian’ works continued to receive some attention. The three-movement Piano Quintet in D minor is a work of some personal significance for Bridge, prompted by the absence of fellow-RCM-student and violinist Ethel Sinclair, temporarily back home in Australia after graduating, but later to return and become his wife in 1908. The Quintet was first heard in private, before its public airing two years later with Thomas Dunhill and the Erinson Quartet. The composer made some quite extensive cuts and revisions at the time, essentially producing something that is both tauter and leaner. The hushed start of the brief ‘Adagio’ introduction leads into an ‘Allegro moderato’, full of passionate, lyrical writing, especially the moving second subject, with the piano part hinting at the need for a consummate virtuoso, with its Rachmaninov-like figurations. There is a lovely dream-like section before the recapitulation, which, as Easterbrook suggests, very much brings to mind the sound-stage of Fauré. The second movement begins ‘Adagio ma non troppo’ in the remote key of B major, with a dramatic and demonic middle section (Allegro con brio), functioning rather like a Scherzo, and leading to a glimpse of the opening material. There follows an impressive climax with the passionate first movement’s theme making a reappearance, to conclude a most effective and moving piece of writing. The finale (Allegro energico) may be more involved with juxtaposing and developing themes from the preceding movements, but does this in a wonderfully nostalgic fashion to create a most fitting and concise close. This never lets up on the virtuoso elements, or the broadly-expressive romantic outpouring throughout, enhanced by its major-key close. Like Bridge a hugely talented performer, Scott showed a gift for music from an early age and was sent to the Hoch Conservatory in Frankfurt to study piano at twelve. Scott, who was also an author, poet and occultist, was essentially a late-romantic composer, but whose style was strongly influenced by impressionism, and his harmony notably exotic. If in his early work it was perhaps over-sweet – Alban Berg dismissed his music as ‘mushy’ – it became steadily more varied and more refined in his later years. English conductor and composer Eugène Goosens called Scott the ‘Father of modern British music’, and he was also appreciated by Debussy and Ravel, his close friend Percy Grainger, Richard Strauss and Stravinsky. He was known as the ‘English Debussy’, though this is, in reality, a rather tenuous association. Perhaps not surprisingly, the opening movement of Scott’s Piano Quintet No. 1 has a less than ordinary tempo indication: – ‘Andante con esaltazione’ (‘exaltation’, ‘fervour’ or ‘excitement’). Even within the first forty-one bars of the opening, the score shows some thirty-one changes of metre, while the ear detects only minor changes in such a fluctuating pulse. There are many chromatic harmonic changes, with augmented triads mingling freely with conventional diatonic chords (major / minor). The development leads to an awesome climax, which partly transmutes some of the opening material while introducing a calmer passage from the piano, with strings later muted. This to the even more hushed close. The short second movement (Allegro grazioso ma non troppo) serves as the Scherzo, initially light and cheerful enough, but where reflective and more pensive elements are never very far from the surface; the rippling ending, though, does ensure it finished as it started. The slow movement (Adagio con gran espressione) is, however, about intensity again. It begins with a passage for strings, into which the piano soon joins, as material from the preceding movement is reworked and a new motif appears. This leads into a section of light-heartedness, but which is gradually replaced by the original theme, growing chromatically once more to an effective climax. This then subsides but quickly rebuilds to lead straight into the Finale (Allegro con molto spirito). This is formally complex, and, as in the first movement, there is a great deal of metrical unrest. There is an opening section that projects the musical ideas forward in elated mood, which then transforms into a far more reflective portion. However the opening mood is dramatically restored, rounding up a lot of previous material along the way, as the music rushes precipitously to a ‘fortissimo’ close of lushly sustained strings and clattering piano chords. This is an important reissue – it was previously released on British Music Society (BMS) (review review). Both works have something original to say, and form valuable additions to the genre, especially from the standpoint of English composers and music. If Terroni had had his wish, and the Scott Quintet had appeared on CD coupled with the Holbrooke Quintet, this would possibly have been even more important, especially for musicological reasons. However, as an avowed romantic, I have to express a personal preference for the Bridge over the Scott, if only because, in its revised version, it is eminently compact. There are equally lovely moments in the Scott, but perhaps a little judicious pruning might have helped here too. Either way, the performance and recording are both first-rate. PS: In this context we should note the differently coupled all-Scott CD from Dutton Epoch which offers Scott's Piano Quartet (1903) and Piano Quintet (1925). Ed.